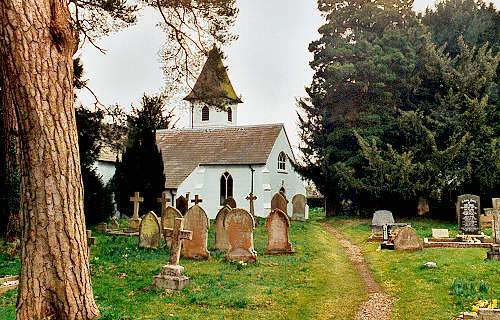 The parish of Whitewell (also known as Iscoyd or Iscoed) lies entirely in Wales, occupying the north-eastern portion of Maelor Saesneg, the detached part of historic Flintshire. However, for ecclesiastical purposes, it has long been associated with Malpas, Cheshire, England; and it is in the Diocese of Chester. The two wells from which the name is derived lie to the south of the church. There is indication of a place of worship on the site from very early times; and the parish registers of Malpas show that a chapel was in use at Whitewell in 1570. Whitewell was a chapel of ease within the parish of Malpas until 1885. The old black and white chapel, which was constructed of timber and plaster, collapsed in 1829 while attempts were being made to restore and enlarge it. Sketches of the old chapel, drawn by Miss Marianne Congreve, the local landowner, have survived. The present building, of brick, cement-washed white, was constructed about 1830, at the expense of Miss Congreve. Some parts of the old chapel were used in the construction of the new building, especially the roof timbers and various oak panelling. The spire and clock were added in 1898. By an Order in Council on 19 May 1885, Whitewell was created a parish in its own right; and although entirely in Wales, it remained within the Diocese of Chester for ecclesiastical purposes. Following the disestablishment of the Church in Wales in 1920, the parishioners elected to stay with the Church of England, in the Diocese of Chester. For family history information about the church and parish, visit the GenUKI Whitewell page.